Other photos: Bow, Overhead, Stbd Aft, Port Profile, Stern, Twin 2-Tone 350 Yamahas, Twin Engine Flush System, Hot/Cold Shower, Cockpit, Cockpit Aft, Cockpit Aft 2, Fiberglass Folding Rear Seat Open, Transom Door, Gunnel Port, Dive Door, Dive Door Open, Polished SS Down Rigger Mounts, Cockpit Forward, Lighted Aquarium Style Livewell, Helm, Helm Seating, Electronics 2, Electronics, Ice Maker and Storage Box, Forward Seating 1, Forward Seating 2, Cooler Storage and TV Cover, Custom Hard Top, Hard Top, Bow, Bow Cushion (Old Photo; Currently in Storage), Lewmar Windlass, Bow Facing Aft, Cabin Entrance, Cabin, Galley To Stbd, SAT TV, Stereo, VHF, and DVD Player, Hanging Locker and Fridge, Isotherm Fridge, Forward Berth, Berth with Filler, Berth Facing Aft, Separate Head, Sink, Electric Head, and Shower, Removable Baitwell (Old Photo; Currently in Storage), In Console Wiring and Batteries, In Console Wiring, Kohler 5kW Generator, Additional Profile 1, Additional Profile 2, Additional Profile 3. "Carry On"is a pristine, one-owner Intrepid 350WA 2009 that has been lift-kept since new with only 172 hours of total use. After 10 years, this Intrepid still shows like new; she is cleaner and more heavily optioned than any boat I've seen in this vintage. Twin 2-tone custom painted 350HP Yamaha 4-Strokes provide a 40mph cruise and top speed of 58mph. 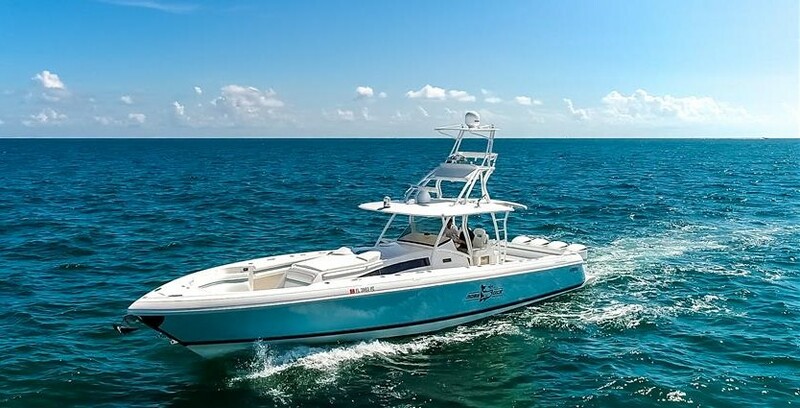 She is perfectly equipped for fishing, diving, and entertaining in South Florida and the Bahamas with an upgraded 312 gallon fuel tank for additional range. The Sea Foam Green (hull sides, cushion accents, and underside of the hard top) pairs well with the bottom, boot stripe, and powder coated aluminum --- this boat receives envious looks wherever she goes. Ready To Fish: (12) Rod Holders, 15' Outriggers, Aquarium Live Well, 2nd Removable Live Well, Electric Down Rigger Mounts, Etc. If you are in the market for a 350WA, you will not find one better than "Carry On". Contact the listing agent anytime to schedule a showing or present an offer.